INDUSTRY.co.id - Jakarta - President Joko Widodo (Jokowi) said, the celebration of 73rd Independence Day on Friday (08/17/2018) tomorrow is a momentum to recall the spirit of Indonesian unity which has been proven by the nation's founders, pioneers, and fighters, in seizing and maintaining independence. "At that time, all the nation's children got rid of differences in politics, ethnicity, religion or class, only to realize an independent Indonesia," said President Jokowi in his address to the 2018 MPR Annual Session at the MPR / DPR / DPD Nusantara Building RI, Jakarta, Thursday (08/16/2018) morning. Affirmed by President Jokowi, differences are not a barrier for freedom fighters to unite. In this unity, they found tremendous energy to move all their energy, mind, and sweat for independent Indonesia. In the unity of Indonesia, the President continued, the freedom fighters found solidarity, caring, and also the spirit of sharing among fellow children of the nation. Solidarity, caring, and sharing among fellow brothers, one nation, one Language, and one homeland. Now, after 73 years of independence, according to President Jokowi, we must continue and the spirit of the freedom fighters to work realistically to fill independence, to work realistically to fulfill the promises of independence, and to work realistically to realize social justice for all Indonesian people. For this reason, President Jokowi invited all the people to return to the spirit of Indonesian unity, to return to the spirit of caring, and to share with fellow nations without discriminating on the origin of ethnicity, religion, or class. If the Indonesian people want to remain united, share, and care for their fellow citizens, the President believes, Indonesia is no longer just a name, or a picture of a series of islands on a world map, but rather a force respected by other nations of the world. "I believe in the spirit of unity, caring, and sharing, coupled with joint work, we will be able to face all the challenges of the future, achieve the nation's achievements, and develop a brilliant Indonesia," said President Jokowi. 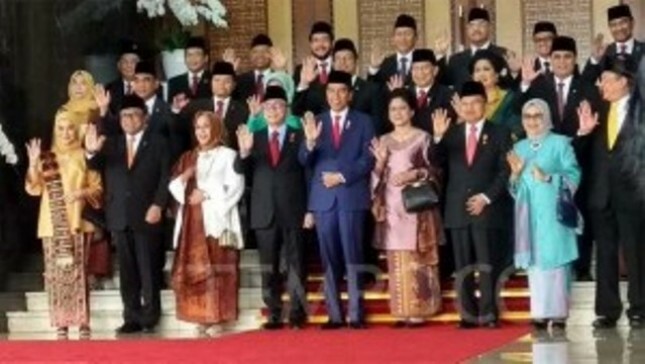 The 2018 MPR-Annual Session in addition to being attended by First Lady Iriana Joko Widodo, Vice President Jusuf Kalla, Mrs. Mufidah Jusuf Kalla, leaders and members of the MPR-RI, was also attended by Chairmen and Deputy Chairmen of State Institutions, ministers of the Working Cabinet and the head of the non-ministerial government agency, the third Indonesian President BJ. Habibie, the fifth Indonesian President, Megawati Soekarnoputri, and former Vice President Try Sutrisno and Boediono.